Your journey’s throughout the Zelda titles have mostly taken place in the Light World already, as it’s just simply Hyrule. However, in a few Zelda titles, there also exists a Dark World (but I’m pretty sure you guys knew that already). The Dark World belongs mostly to A Link To The Past, where Link travels between the Light and Dark World in order to complete certain objectives. Both worlds have their own fitting theme, with altered terrain and music that very well suits their appearance. So the question I’d like to ask you guys is, which do you prefer? I’ll be talking about it a bit further in here, so if you’d like to check it out, don’t hesitate to hit the jump! In A Link To The Past, your journey begins with Link waking up in the Light World. After various things go down, Link must traverse through the Light World to three different dungeons, all in order to obtain the Master Sword. Once obtained, Link sets off to Hyrule Castle to take down the dark wizard, Agahnim. Once Link defeats him, however, Agahnim pulls Link into the Dark World. The Dark World is where the eight other dungeons take place in the game. The scenery is changed, enemies are different, the song is new and the terrain has been altered. 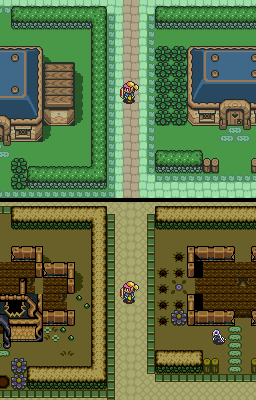 It’s a complete parallel to the Light World, and it gives the game a total of two overworlds to explore. The Dark World has also been traversed in A Link Between Worlds (the sequel to ALTTP), Four Swords Adventures, Twilight Princess (Twilight Realm), and in other words was mentioned in Spirit Tracks. Personally, it’s hard for me to choose. 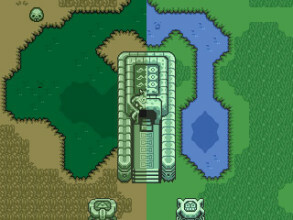 As I’m seeing things from A Link To The Past’s perspective, I love both. I love the Light World for being- well, light. It’s brighter, more cheerful, etc. Whereas I love the Dark World too, for being dark and distressed. Not to mention it’s jam-packed with dungeons. It’s where most of the game takes place! So putting it that way, it makes the decision a bit more difficult. But as always, to each his own! And I would like to just throw these two tracks down below. They’re definitely worth giving a listen if you’re having trouble debating, as well. So, with that said (or heard), what are your thoughts on the topic? Do you prefer The Light World, or The Dark World? Do you have an equal opinion, or perhaps you’d like to say something else about one or both? If so, do sound off in the comments!